When I was a kid, I was a HUGE ice cream fan. Every day after church my folks would take us out to eat and then over to Thrifty’s to get ice cream. For those of you who aren’t familiar with Thrifty’s, it was sort of like an old school CVS, Walgreens or Rite Aid. In fact, Rite Aid bought out the Thrifty’s chain several years ago. Unlike most drug stores though, Thrifty’s had a secret weapon: ice cream. Cheap ice cream. Deliciously cheap ice cream. Not only was it tasty and cheap (back in the 80’s you could get a scoop in a cone for about a quarter), but it was also unlike any other ice cream I’d ever had: it was cylindrical. Yup, that’s right, the ice cream was dispensed by what sort of looked like a caulk gun and when it was placed onto the cone, it was perfectly cylindrical. Can’t quite get the visual? Well, here is the ice cream “gun” and here is the actual scoop (my favorite, mint chocolate chip) I found on some other blogs. Thrifty is what made me fall in love with ice cream. Especially mint chocolate chip. However, as I got older, I kind of grew apart from this frozen love. Sure, I still liked it, but whenever I was given a choice of cake or ice cream, I always took cake. Or made cake. Or just generally surrounded myself with cake, cookie or brownie like products. It wasn’t really until the last five years or so that I have reconnected with ice cream and boy am I glad I did! Yesterday when I was grocery shopping, I found myself pausing in the ice cream aisle. I wanted some ice cream, but I’m also hoping to restart my diet and exercise program this week, so I realized what a danger putting a container in my cart would be. Even the cute little pints from Ben and Jerry’s are hazardous since they have four servings in them, but sort of seem more like a single serving treat on some days. I was about to leave the frozen section with only a heavy sigh when I spotted some teeny tiny little containers of Haagen Dazs. More importantly, I spotted one that read chocolate peanut butter. Not only have I been on a bit of an ice cream kick lately, but I’ve specifically been on a bit of a peanut butter ice cream kick. Well, really a peanut butter kick in general. I think it started a few weeks ago when I had this crazy whim to swirl big ol’ tablespoons of crunchy Jif into my packaged brownie mix. Those brownies were so darn good that not only did I eat way too many of them, but I found myself craving peanut butter everything. 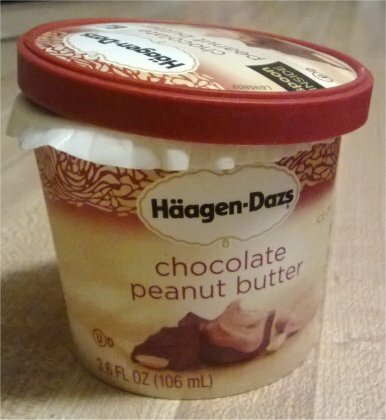 So, when I saw the tiny little single serving container of chocolate peanut butter Haagen Dazs, I simply could not pass it up. The greatest part about it is that it is a single serving of ice cream, so there is no way I will overeat. The little container had 250 calories in it, which is less than a scoop at Baskin Robbins, but was still enough to make me feel like I fulfilled my sweet craving for the night. The chocolate was just a tiny bit bitter, but I find that is often true of chocolate ice creams. Heck, I didn’t even like chocolate ice cream until about five years ago for this very reason. Still, even though it had the tiniest bitter chocolate hints, it was smooth and creamy. Despite being frozen at the grocery store, it was easy to use the tiny plastic spoon included in the top of the container to dish it out as soon as I opened it. 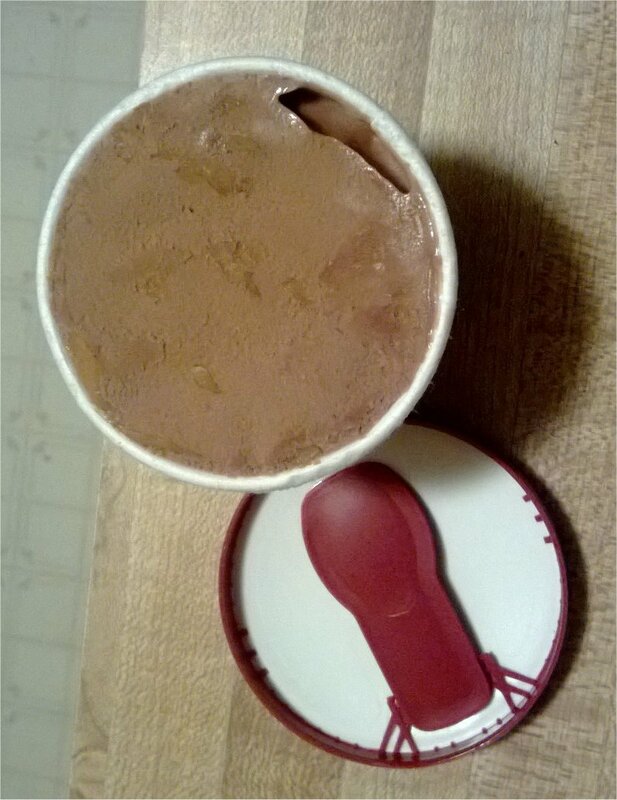 Usually when ice cream is sitting in my freezer for any amount of time, I have to let it thaw a bit on my counter before I try to dish it out, but that little plastic spoon went through it like butter. The peanut butter was silk and slightly salty. Not as salty as other peanut butter ice creams I’ve had, but I think it was better because the chocolate was also not as sweet as say Baskin Robins chocolate peanut butter ice cream. I would have loved it if it had been a chunky peanut butter, but I’ve yet to find a peanut butter ice cream that uses chunky pb instead of the smooth stuff. The texture was smooth and it melted right on my tongue. Still, chocolate peanut butter ice creams always leave me slightly lacking. I want them to taste a bit more like an ice creamed Reese’s cup and they never do. Well, sure, the Reese’s flavored ones with vanilla ice cream and chunks of Reese’s do, but I mean the actual chocolate ice cream with peanut butter ribbons in it. They balance is never quite right. I always think there needs to be more peanut butter and that it needs to be a bit more like a peanut butter sauce than a thick ribbon of peanut butter. Cost: 9/10 (only $1.27 which is far cheaper than an ice cream scoop). I’ve always been a cat person. Not that I have anything against dogs. When I was a kid we even had a couple of dogs and as much as I loved them, there has always been something about a cat curled up in my lap, that I just love. When I was finally out on my own and had my own apartment, my best friend found a litter of kittens in the rather scary maintenance shed of her apartment complex. What she was doing in the shed is still a bit of a mystery, but the end result was half a dozen little balls of fur who all needed lots of love and warm laps. I fell absolutely head over heels with the one I nicknamed “second to runt.” As the oh so clever name implies, she was the second smallest in the litter. At least for the first few weeks. But then, even the runt outgrew her and was quickly snatched away by neighbors. Second to runt was my favorite and every time I visited, I spent all my free time letting her run all over me. It just so happened that my birthday fell somewhere between her sixth and eighth week of life. My ex (who was quite allergic to cats), decided my love for her over-ruled his allergies and in a moment of great sacrifice, put a little bow on her and let me bring her home. Olivia was my pride and joy. Olivia and I have been together for somewhere between 12-14 years now. She is still thin as a rail. She still loves to curl up next to me, but now that’s only after the kids have gone to bed. I’m not sure she’s forgiven me for bringing my son home from the hospital almost six and a half years ago. While my kids are wonderful around animals, Olivia wants nothing to do with them. The have never chased her or pulled her tail. They are just too darn loud. She’s always been skittish and constant pounding of their feet and the insane echoes of their voices is just too much for her. She hides most of the day. The same was true for our other feline friend, Jenkiss. He was a stray I was fostering for a local shelter that was out of room. Even though I really wanted to keep him, Olivia didn’t seem very fond of him, so I decided that when the shelter could take him, I’d have to give him back. That was, of course, before my husband (who was just my boyfriend back then), took a liking to him. My husband never had pets as a kid, and he thought Jenkiss was the bees knees. Before the week was over, I got a sheepish call asking me not to give him back to the shelter, so I quickly bought kitten supplies and took them over to his apartment so there was no way my boyfriend could back out. Late last year Jenkiss got sick. We took him to the vet, but to no avail. My husband had to let him go and it about broke his heart. At that moment, he decided he was done with cats. Well, at least with getting any more (Olivia is still around, after all). Even though I sometimes thought how much fun it would be for the kids to get a kitten that would be used to their loud noises–like Olivia, Jenkiss never took to the kids either. I think he actually despised them even more than Olivia. She never hissed at them. The same could not be said for Jenkiss. My kids got used to it and learned to just ignore the cats, but every now and then, my son would get sad that the cats didn’t like him–I knew my husband didn’t want more cats, so I let it go. That is, of course, until Bob happened. Being a cat person is sort of in my blood. Everyone in my family loves cats. My parents were no exceptions. Well, at first my dad was. 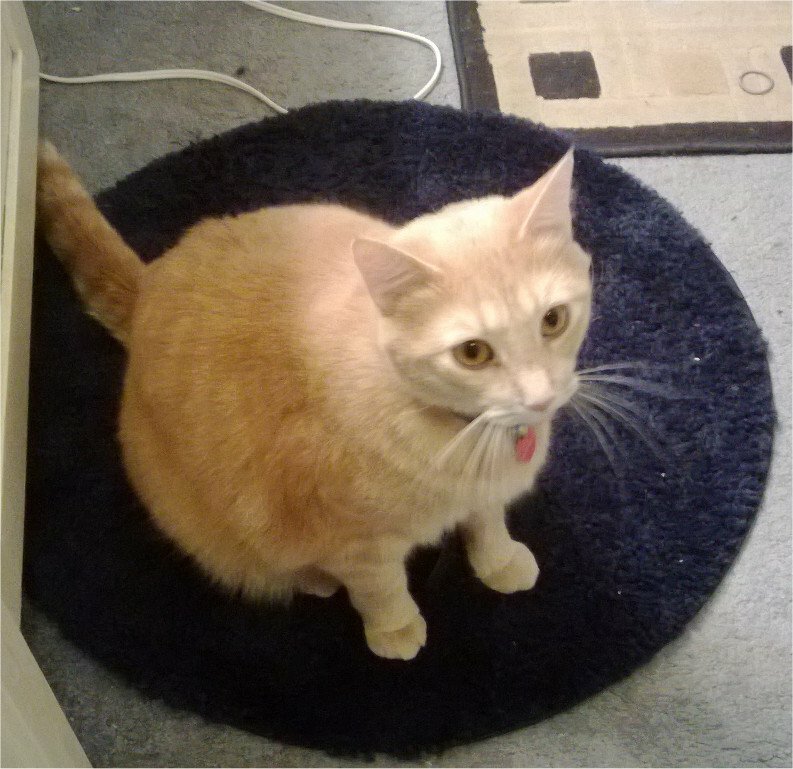 He hated cats (or so he claimed), but when I moved in with him at 14 and begged and begged for the stray kitten my aunt had found, he caved and Pookie came to live with me. It never fails, as much as I showered that cat with attention, she preferred the person in the family who seemingly wanted nothing to do with her. And that, is how my dad became a cat person: a sort of war of attrition. She just plain wore him down with her constant love. He got so used to having a sleeping cat on his lap, that when she passed away (I had to leave her behind when I moved into the dorms), he got another cat. Bob was my dad’s cat. He loved Bob. The two of them could be found every afternoon lounging in my dad’s favorite spot on the couch. Each morning Bob would wait for my dad to get up, and then trot down the hall with him on the way to the kitchen. Like my dad, Bob was a night owl, and I suspect he was a huge bit of comfort to my father as the cancer slowly made his life harder and harder to bear. When my dad passed away last year, Bob was a bit lost. He still had my step-mom and she loved him dearly, but he was my dad’s cat and you could see him pining a little. Now, not so much that the little fatty refused treats, more like just enough to get extra treats. He became my step-mom’s new lap kitty and seemed to be loving life. But then, all of a sudden, my step-mom passed away in June. Once again, Bob was set adrift. He was still living at the house (my aunt came over daily to check on him and the other cat), but he just meowed sadly. My aunt and I had talked about what to do with the two cats, but we weren’t really sure. She already had about a dozen animals and I knew my husband really did not want another cat. A little over a month ago, my son overheard me talking to my aunt about giving clothes to Goodwill. We must have been talking about Bob just moments before, because all of a sudden, I heard this desperately sad cry from across the room, “You mean you’re going to give Bob to Goodwill?” My son’s eyes filled with tears and he begged me to let Bob come live with us. I’m not sure I’ve ever seen him so legitimately worked up about anything in my life. I calmed him down, assuring him that Bob was not going to be loaded up in the truck and tossed aside with the old waffle maker and coats, but it was not enough. He wanted his Pop Pop’s cat. And that’s how Bob joined our family. Unlike Olivia and Jenkiss, he likes the kids. He doesn’t run from them and even lets them pet and kiss him. My daughter has started calling him Bobby and she loves to follow him around the house. He never seems to mind. He’s claimed a spot on our bed where he spends about half of his day. He and Olivia are learning to tolerate each other. Even my husband has been won over by the Bob’s charm. Still, I don’t think we’ll be getting any more cats any time soon. Vacations are wonderful for so many reasons. Sometimes they mean more time with family. Sometimes, and these are often the better times, they mean getting away from family…or at least certain family members. For me, vacation is not only a way to “get away from it all,” and explore strange new ports of call, but also a chance to go on a real adventure: a chocolate adventure. I love combing shops for new and interesting types of chocolates. Sometimes they are brands I can get back home, but haven’t. Sometimes they are completely local. No matter where I go, chocolate is always on my mind. So, on my recent vacation to Charleston, South Carolina, while my little nuclear family was escaping from the rest of our relatives, we headed to the City Market. While we were there, we found a neat little chocolate shop that offered a wide variety of goodies. I bought two chocolate bars there. 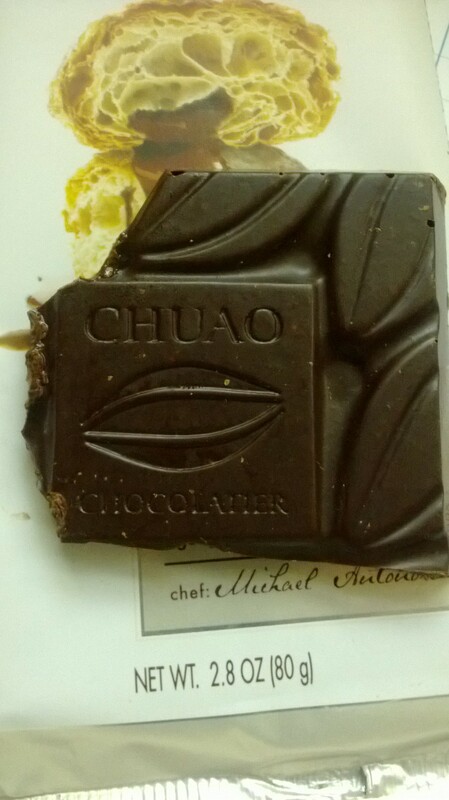 I wrote about the Chuao bar last week. 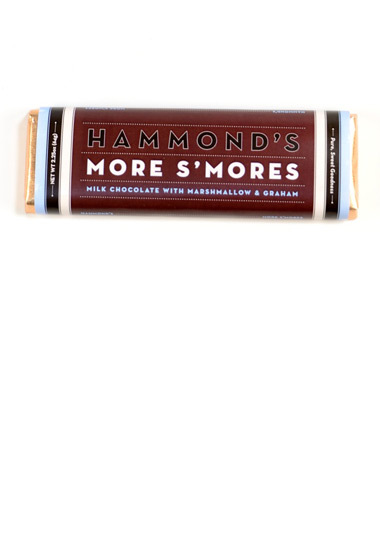 Even though half of that bar is still sitting in my fridge, I was dying to try the second one: Hammond’s More S’mores. Hammond’s started as a small candy shop in Denver, Colorado. The original candy man, Carl Hammond, dropped out of high school and took on a candy making apprenticeship. In 1920, he opened the shop and for 79 years, it remained a family owned business. It has since been bought and the product line increased. They’ve got it all: lollipops, ribbon candy, chocolates, candy canes, and even caramel corn. My interest, of course, was in the chocolate bars. Although the website shows 17 different types of chocolate bars, the store I was at only had about half a dozen. Of those, I went for the More S’mores because ever since I went to my first campout with Girl Scouts in the 2nd grade, I have had an unhealthy love for s’mores. It probably didn’t hurt that my sister-in-law had invited us to a campfire, complete with marshmallow roast (and the opportunity to bring our own s’mores fixins’), but we had to decline since my son was ill. Since I couldn’t make the ooey goey, finger-sticking treats myself, I went for the next best thing. When I opened the package, I was amazed that the entire bar smelled like marshmallows. I’ve never really thought of marshmallows having a very strong smell, but the second that wrapper was off, it was unmistakable. The milk chocolate was extra creamy. It had a velvety texture that the Hershey bar I would have made my s’more with just doesn’t have. I didn’t need to heat the chocolate up because this chocolate was simply melting on my tongue. The crispy graham cracker was in every single bite. It was fine, more like a graham dust, but it was there all the way through. No one factor stood out, it was the perfect blend of marshmallow, chocolate and graham. It reminded me of these s’mores cookies my mom used to buy when I was a kid. We’d heat them up just a tad in the microwave and it was almost like being at a campfire…almost. The bar was so good, that despite my promise to myself, I ate the entire thing in one sitting. Thankfully it was the same size as a regular candy bar, so I didn’t have too much guilt over it. This is the first summer in three years that I’ve had actual free time during my summer break. As a teacher, one of my biggest pet peeves is listening to ignorant people go on and on about how lucky I am to have so much “free time.” They actually seem to think that a few extra weeks of vacation each year negates the hard work I put in during the school year. My husband finally gets it (I think), but I still have friends and family members who feel the need to make some snarky comment about what they’d do with all the extra time I have. If I’m feeling sweet, I just give them a smile that clearly tells them where they can go. If I’m not, I go on my rant about how I wish I had the free time they have when they leave their jobs. I think most people call that time evening. I call it: grading time. But this, is actually not a rant about my lack of free time. No, really, I promise it isn’t. See, for the last three summers, even my vacation time has been so busy that I have not really had time to do anything for myself. Three years ago I had a brand new baby as well as a three year old, so I was desperately trying to keep them both happy and still manage to keep myself from going insane by sleeping here and there. That was also the summer before I got a brand new class: Novels and I had to spend quite a bit of time figuring out how I was going to teach a class which had never been taught by anyone at my school before. Two summers ago, my kids were a bit older and more settled into a routine, but I decided to start my masters’ degree. Even though the classes were all online, it meant an awful lot of homework–usually when my kids were napping or in bed. On top of that, I took on the Advanced Placement Language and Composition class, so I once again had to plan an entirely new class. Last summer, I was twelve months into a twenty month masters’ degree and planning a new Film Literature class. That wasn’t so bad, but then my dad got sick in mid-June and I spent the rest of June and all of July making a 50 minute roundtrip to the hospital anywhere from 1-3 times a day to drop off/pick up my step-mom from visiting and then to visit myself after my kids were in bed. Exhausting is not the word. So, this summer I was THRILLED that my only real issue was completely re-planning an AP class (I’m flip flopping the classes, so this year I am teaching two sections of the same class, but they have to be completely different because one set of kids has already read 90% of the books the other set will need to read). Yes, I am a glutton for punishment. This meant I had free time, to do something I don’t get to do much of during the school year: read books. Well, sure, I read books during the school year, but these books would be different. These summer books would be just for fun! I started sifting through the stacks that have now spilled off the book shelves and into piles all over my floor. Despite the insane number of books I already own that I need to read, I also went on a sort of crazy library spree. I put about a dozen books on hold at the library. For most of the summer, those books remained just out of reach. I was number 40 something for The Fault in Our Stars and number 50 something for the final Sookie Stackhouse book (guilty pleasure). Last week, however, it was like I won the library jackpot. Every day I got a new automated call about a book that was now available for me to either pick up or download to my Kindle. It was a veritable feast of books. So, I had to get down to some serious reading. 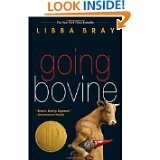 My latest read was Going Bovine by Libba Bray. My best friend is a huge connoisseur of young adult fiction. I wanted something fun to read, so she suggested A Great and Terrible Beauty by Bray. I was hooked. I loved her writing style. I loved the characters. I loved the mix of Victorian England and fantasy. I wanted more. So, when she finished returned her copy of The Diviners, since I was right there, I just happened to check it out too. Once again, I absolutely loved it (even more so than the Gemma Doyle trilogy). The Diviners is much darker than the her earlier work, but I loved the darkness of it (just a head’s up, there are some serial killer descriptions that would do Dexter proud). Since the latest book in the series isn’t out yet and I couldn’t get Beauty Queens on my Kindle, I figured I might as well get Going Bovine since there was no line for it. I was about thirty pages into this book when my library ship came in and I got bombarded with other books to read, but any book that offers up a “death-obsessed, video gaming dwarf and a yard gnome,” has to have some real merit, right? This book was definitely interesting. I liked the fact that it was told from a male narrator’s perspective since her other novels are told from the female POV. The chapter titles were amusing and the dialogue was witty. The book was fast-paced and took no time to read. Her descriptions put me in the scene and I appreciated the fact that the teenagers actually talked like teenagers. No three page monologues of angst or wisdom beyond their years. The characters curse when they are angry (or happy, or annoyed), just like real teens do. They get angry, they act irrational, they bleed both literally and emotionally. It’s good stuff. Now, it’s also dark stuff. Although it does have the plot of a roadtrip buddy movie, and appears light-hearted on the surface, it is anything but. In many ways, the story parallels that of Don Quixote and just like that tale, there is a definite sadness as the main character loses his mind, slips into madness and is lost to his fantasy world. Just like Quixote, Cameron must fight his windmill demons. His Dulcinea (named Dulcie in this book) is just as ephemeral and unreal as Quixote’s. She is, without a doubt, a thing of beauty, if only to Cameron. This was a good read. If you are at all a fan of Quixote, definitely one to check out (I love when books and movies pay tribute this way–think Clueless to Austen’s Emma). Don’t expect a happy ending though. Just like Don Quixote, it is quite funny at times, but always with an underlying edge of melancholy and tragedy. As I was sitting in the pediatrician’s office last Friday trying to figure out the mysterious fever and sore throat my son had, I got a call from an unknown number on my cell. This doesn’t happen very often and when it does, I generally ignore the call. I’m not often a fan of talking to people I do know on the phone, so there is no way I want to talk to someone I don’t. A few moments later, I heard my voicemail tone. Since the doctor wasn’t with us and my kids weren’t being monsters, I went ahead and listened to the message. I figured it was probably the library calling to tell me that yet another item I had requested had come in (this sounds like a good thing, except that I’ve had a fairly dry spell at the library all summer and suddenly in the last week, four different books I’ve been waiting for are now ready for me to check out). To my complete and utter surprise, it was a florist, at my house, wanting to deliver, well, flowers. Now, I have a pretty darn good husband, but he’s not exactly a roses kind of guy. He used to buy me flowers, back when we were dating, but even then, he thought flowers were kind of a waste of money since they died so quickly. He’d rather buy me something that lasts. I knew they couldn’t be from him, so I was thoroughly perplexed. When I got home, my confusion continued. There, on my porch was a lovely arrangement of carnations and lilies, all wrapped up in cellophane. I hurried to get them open so I could grab the card. There was a card, but all it said was “Just because.” No name, no city, nothing else. It wasn’t even handwritten (not that handwriting would help as I could only identify like four people’s handwriting ever and one of them is dead). 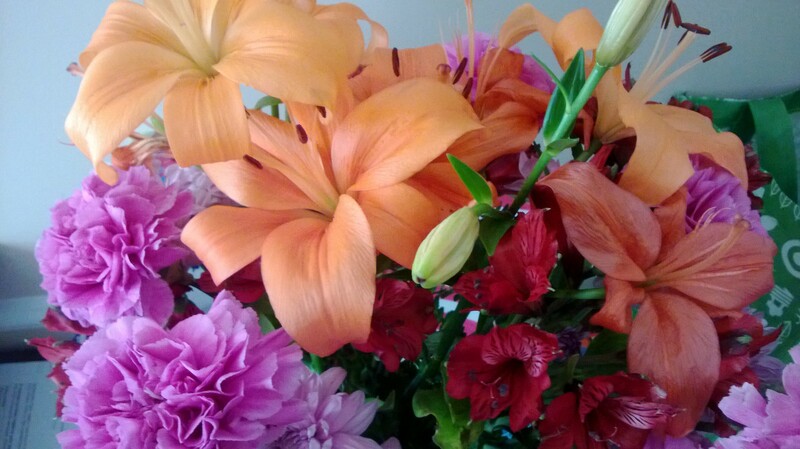 I’d been having a bit of a rough time of it, so I thought, maybe, just maybe, my husband had turned over some freakish spontaneous new leaf, but when I texted him about my flowers and their lack of card, his response was “weird.” Yeah, that pretty much took him off the table. My son thought maybe my best friend had sent them (in all fairness, he knows like six adults). Now, she does love flowers and has always been the kind of gal to just stop off at a flower shop to buy some daisies or lilies. However, I figured if she was going to get me flowers, they’d come in a vase from her house and they’d most likely be a grouping of tulips or daffodils she got while at Trader Joe’s, not a professionally arranged bouquet. Sure enough, when I texted her, she thought I might have a secret admirer (which was actually my son’s first thought…not sure where he got that from). I tried to call the florist to see if the card had been left at the shop, but sadly the flowers had been ordered online and sent with no card. 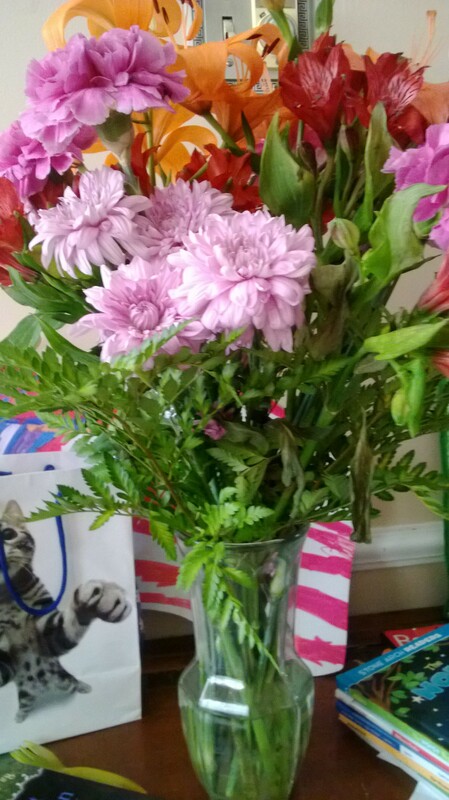 She apologized, but was glad I liked the flowers. The list of people who might send me flowers, especially “just because” was shrinking quickly. I’d had dinner with three school friends the night before and just told one of them my step-mother had passed. Now, when my father died less than a year ago, this same friend sent me a beautiful arrangement which arrived just hours after she found out. In addition, she jumped in her car and drove an hour just to check on me. I thought it could have been her. Still, she’d just seen me the night before and we’d already commiserated together. I was almost ready to give up my quest when I remember the modern day Sherlock Holmes at my fingertips: Facebook. I made a comment about the lovely anonymous delivery and within minutes I got a text from my aunt asking me what they looked like. When she told me the name of the arrangement “Light of my Life,” I let a few tears fall. The mystery had been solved. This is why I love my aunt…just because. Family vacation can take on a lot of different meanings. Before I had kids, vacation was just about the best word in the English language. It didn’t really matter what kind of vacation was planned (or barely planned as a few of them turned out to be), there was bound to be some adventure. Or, as was the case of our fairly glorious Jamaican vacation, no real adventure, just lots of lounging on a beach under a palm umbrella, sipping rum punch and reading. That may have been the best vacation I’ve ever taken. Of course, once I had children, vacation took on a new meaning entirely. These days, I find that I need a vacation to recover from my vacation. This is not just me getting older, but rather, me getting older and having young kids. The sheer volume of bags that fill my trunk whenever the word vacation is uttered astounds me. Back in the day, it was me, one suitcase and a purse. Now it is me, four suitcases, blankets, toys, snacks, backpacks, DVD player, DVD’s and an assortment of other packages I’m no doubt forgetting. Thankfully my kids are old enough that I no longer have to bring the big equipment, like pack n plays, high chairs and strollers. Still, my Honda Accord sunk down toward the road about a food once we loaded the trunk up for our recent trip to the beach. Family vacation is a doubly daunting word in our household because there are really two types of vacations: the ones I plan for our little household and the giant beach vacation my mother-in-law plans for the entire extended family. One week each year, we load up the car, drive 12 hours and make our way toward South Carolina, where we pile into a six bedroom, eight bathroom house on the beach. This seems perfectly reasonable until we get there and all the other aunts, uncles and grandparents are also there, which means 15 of us are all bunking under the same roof. It gets crowded fast. Especially since my mother-in-law always invites her cousins, or siblings or nieces and nephews to come spend a day or two with us as well. This year there were actually 23 people in the house one day. Amidst all the catching up, sandcastles and homemade ice cream (hey, I never said it was all bad, just crowded as can be), one of the really high points of the trip is that my husband and I load up our kids and head into Charleston for a day on our own, just walking around town and having fun. This year we stopped into the Charleston City Market. We’ve been before, but not since they remodeled it, complete with a completely enclosed section that is blissfully air-conditioned. While the majority of the market is still open-aired. After walking around downtown on a stiflingly hot day, it was a wonderful surprise to get a blast of cool, comforting air, even if only for a little while. It was inside this air-conditioned section that we found Dolores’ Southern Delights, a fun little candy store. While my husband contemplated buying a bacon flavored soda, I studied the chocolate offerings. I was so enthralled with the selection of tasty looking candy bars that I didn’t even notice the assortment of handmade truffles and molded chocolates in the front case. 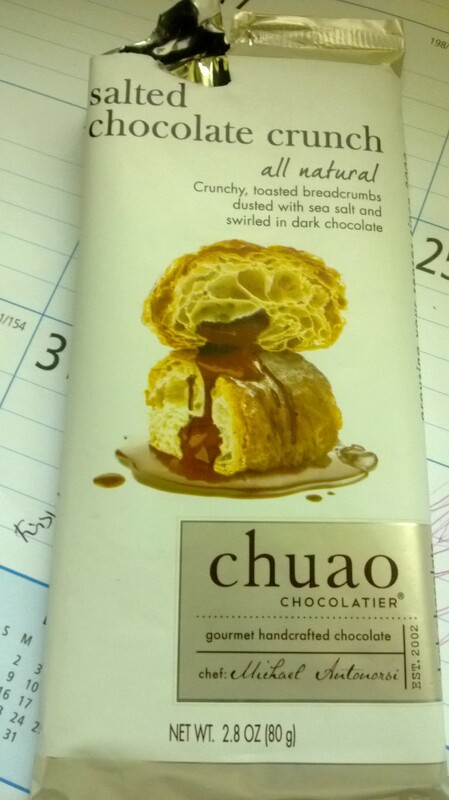 Instead, I picked up a Chuao Salted Crunch bar. Now, I’ll be honest, the picture on the wrapper looked so good that I didn’t really pay attention to the description on the bar. 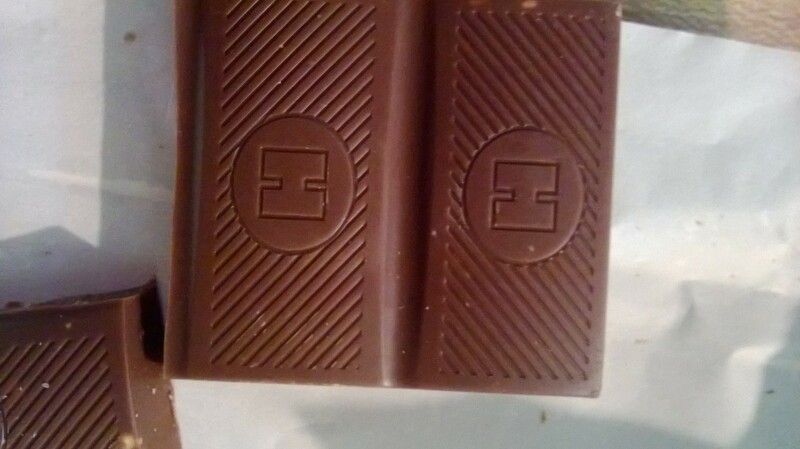 I failed to notice that it wasn’t a salted caramel bar AND that it was dark chocolate. Epic fail on my part, I know. But the picture of what looked like a little cream puff drizzled in chocolate with the promise of sea salt added in was enough for me. I think, had it still been going by its original name, the panko bar, I would have thought twice. Not that I don’t love panko crumbs, I do, but it would have solidified that this was a bread crumb crunch, not a cream puff crunch. It also would have made me realize it was dark chocolate and I might have reached for another offering. The dark chocolate was bitter, but not overwhelmingly so, which was nice. All too often dark chocolate prides itself so much on being dark that the bitterness overwhelms anything else. The bread crumbs in the bar reminded me a bit of the “crunch” in a Nestlé’s Crunch bar, but only from a textural standpoint. They didn’t taste like those bits of rice at all. They didn’t actually add much flavor, just a texture. There was a definite salty kick as each bite dissolved in my mouth and I really liked that. I think the dark and the salt would have been really interesting with the tart of a fruit, especially with the bread crumbs. Would have been a bit more like a raspberry puff dipped in chocolate. As it was, it was good, but not spectacular. I would definitely eat it again if someone offered it to me and I am no intrigued to try several of his other offerings–I’m thinking both the potato chip and the rocky road bars look tempting. I’m not really one to read celebrity autobiographies. I won’t pretend for a moment that I’m above the tawdriness of Hollywood. Sure, I’ll admit it, when I’m in the check out line, I read all the headlines of People and Us and whatever other magazines grace the display stands. I’ve even watched an E! True Hollywood story or two. However, for some reason, reading the latest tell all from Starlet A or Action star B was just never on my list. I’ve read autobiographies of writers. I love travel narratives. I’m fascinated by non-fiction accounts of strange and interesting life choices (Into the Wild, Seductive Poison, Assassination Vacation, Small Sacrifices, etc). It wasn’t until I read Wil Wheaton’s Just a Geek that I thought, “yeah, maybe I can read a celebrity book and not feel like I’m entering the pages of a gossip column. Now, this probably has way more to do with my crush on Wheaton, which started when I was 12 or so. It probably also doesn’t hurt that one of the reasons I feel in love with Wheaton is that he was on a show that totally appealed to my geek nature: Start Trek: The Next Generation. And, I’ll admit what pushed me over the edge to read it was my best friend introducing me to his blog, which was clever and just darn fun to read. So, I picked up the book and loved it. Last year, when I included a huge new project for my Advanced Placement English students which required them to read a work of non-fiction of their choice, I made a long list of all books I’d ever read. I wanted to make sure kids were reading books I was familiar with so I’d have a better chance of figuring out if they were trying to snow me by not actually reading the book. I was thrilled when a few of my kids, who also pride themselves on being geeks, took my advice and read Wheaton’s book. Also like me, they really loved it. I was additionally thrilled because I was supposed to attend a comic convention Wheaton would also be at. Being an uber geek (and still having a bit of a crush), I couldn’t wait to get him to sign my copy AND tell him I actually use his book in my classroom. How cool would that be? Unfortunately, my best friend, who always attends the con with me is moving 9 hours away and has to report for her first day of work on the Friday of the con, so it is out. I was despondent…that is until she found another con to appease me. Now, Wheaton won’t be there, which just about broke my heart. In a fantastic turn of events though, John Barrowman will be. Like most residents of geektopia, I feel in love with Barrowman when he first blazed onto my screen as Captain Jack Harkness on Doctor Who. I have been a Whovian since I was nine or ten years old. With the exception of a few recent episodes which are patiently waiting for my on my DVR, I have seen every episode of the show that has ever aired in the United States, all the way back to An Unearthly Child from 1963. My dad got me hooked on the show when I would visit him during the summer. The local PBS station out of Chicago aired episodes at 11:00 on Friday nights, right after Monty Python. It was like Nirvana for my dad. My dad and I would camp out on the sofa and watch Monty Python (most of which I did not get until many, many years later) and then I would be glued to the TV for nearly 90 minutes for Doctor Who. Those nights watching Doctor Who with my dad are still some of the best times of my childhood. As an adult, my dad and I got to rekindle our love for all things Who when the series started back up. Then, we both squealed with delight when we found out Captain Jack was getting his own spinoff, Torchwood, which we both watched, loving every minute of it. So, when I found out Barrowman was going to be at this con, I figured if I couldn’t get an autographed copy from Wheaton, I was damn sure gonna get one from Barrowman. I bought his book, Anything Goes, and plowed through it in a couple of days. Now, Barrowman co-wrote the book with his older sister. Actually, he recounted stories and she wrote the book. He openly admits that right off the bat. While she is not quite the witty writer I find Wheaton to be, the book was full of fun, if often very tangential stories of Barrowman’s life. It is literally a potpourri with no real structure to it. While I think to a lot of people it could get confusing since in mid-story he sometimes jumps off on a tangent which takes him several paragraphs (or pages) to come back from, his book was like every story I ever tell, so I found it easy to related to. 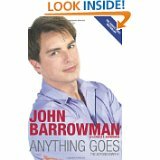 Actually, the more I read of the book, the more of a kinship I felt to Barrowman. I mean, our lives are nothing alike, I realize that. There is something about his gregariousness, his willingness to tell it like it is, his unfaltering love for his family, his loyalty, his creativity and his tangential story-telling brain that speaks to my soul. I think if we met in another life, we’d be quite good friends. I also found that we have quirky little things in common. For example, his first true introduction to Doctor Who was watching the same late night line up on the same PBS station out of Chicago (and we both discovered Who at the same age, although his was a few years earlier since he’s a tad older). We both have a love for performing in musicals (although he was successful). We both also directed children’s theater and are eternally frustrated with the oversaturation of funds for sports while the arts are almost entirely neglected. Once again, through his stories, I felt a connection with Barrowman. While the writing may not exactly be Faulkner or Fitzgerald, the stories are heartfelt and entertaining. There is a positive message of following dreams and living your life never making excuses for who you are or trying to conform to something you are not. There is a wonderful message about the love and support of family and friends. Barrowman is both cocky and charming. After reading his book, I found myself crushing even harder. And, now I have a fun little conversation piece for him too: just like Wheaton’s book, I plan to use his book to help appeal to my fellow geeks in Advanced English. I know that when I bring his book to class, at least five of my students will flip because he fills two spaces in their geek lexicon: Who and musical theater.